I made this piano note guide because I couldn’t find any decent quality ones online. 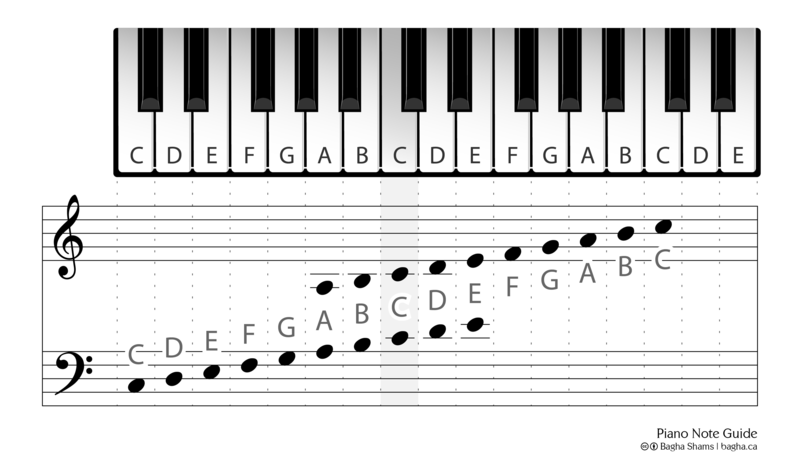 This is simply a guide for beginners to identify notes on the stave and their counterpart keys on the piano. Feel free to download and print the images for your uses. My first smartphone was a very high-resolution phone: the Nexus One had a 800×600 display that made every other phone—especially the iPhone—look awful. This was the thrown glove that drove Apple to take ownership of high-resolution displays and name-brand the idea with the “Retina” moniker. The iPhone 4’s 330 ppi was a small but important leapfrog over the competition, and it cemented the importance of display pixel density for the industry. The competition didn’t take this threat lightly, and their newest flagships run at 6× the resolution—and almost double the ppi—of that Apple phone. In 2015, pixel densities have reached the point of absurdity. Today’s bleeding-edge resolution du jour is Quad HD, or 2560×1440. This resolution is so incredibly high, it would take a 9″ screen for this resolution’s pixel density to reduce to the iPhone 5 & 6’s. These <6″ phones have a higher resolution than the 10″ retina iPad, and are almost 10× the resolution of my old Nexus One. What’s the point of pixel density past 300ppi, which is where Apple claims the human eye can no longer see pixels? Many of us have been asking this question for the past couple years. 1080p on its own was crazy high, so Quad HD has left many of us scratching our heads. HTC seems to agree, as they have kept their line of One phones at the same resolution through the years. Incredible pixel densities are not completely without their use. In 2012, Oculus demonstrated that a lens held in front of a mobile display can wrap images around our field of view, immersing the viewer in the image and creating a true VR experience. Warping an image blows up the pixels, spacing them out and exponentially reducing the pixel density for the viewer. Early prototypes of the Oculus Rift used a 1280×800 display, which must have produced a very blurry image. But thanks to the obsessive small-screen resolution increase on the part of Samsung, LG, Sharp, and JDI, virtual reality kits will soon be able to produce a life-like image to the viewer. According to one Valve engineer, realism may require a display somewhere near 8K resolution. 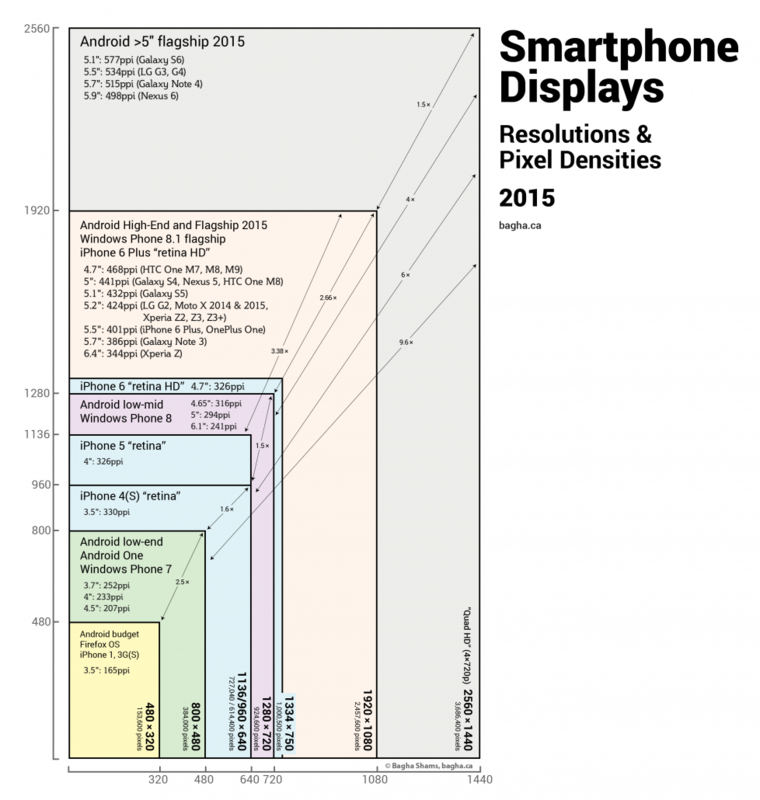 I would say 8K (7680×4320) resolution on a mobile display sounds impossible. But then again, back in 2011 I wouldn’t have believed 1080p would be possible, much less passé today. All ppi calculations were done using online tools such as this one. Open the source image to view the full-size, pixel equivalent on your screen. Tags: phone resolutions, phone screen resolutions, smartphone displays, mobile displays, mobile screens, smartphone resolutions, smartphone screens, mobile resolutions, phone screens, phone resolutions, phone ppi, phone displays, mobile ppi, smartphone ppi, pixel densities, device resolutions, device screens.